Hi...I am no longer able to see reports. We upgraded to Moodle 3.5, is the report location been moved? The options that you are seeing seems to come from the drop down menu when clicking on the gear icon in the results page for an H5P activity. To see the details of the report you need to click on the report link. I attached screenshot for this. If you are seeing a totally different gradebook page please attach the screenshot. In addition to this administrators will not see their own grades in the gradebook since they are not considered a student. 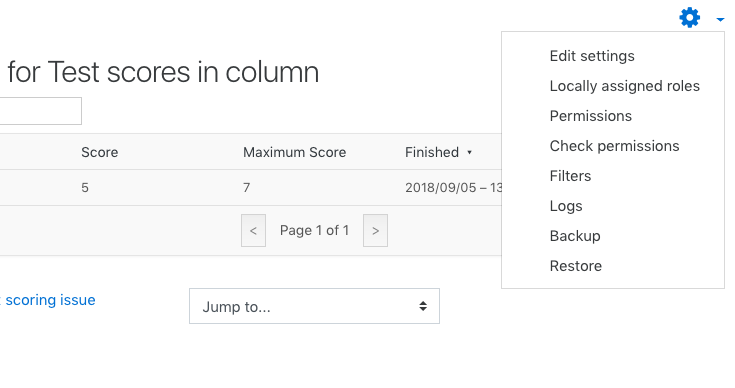 Try logging in as a student and check if you it will generate a score. Thank you, but I have no option to view a report. That is the problem. Before we upgraded to Moodle 3.5 I was able to view reports and results. I can no longer do this. I am not trying to view my own results, it is that of the students. 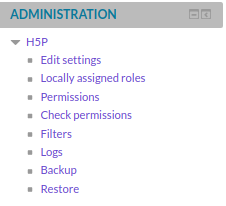 We have put in a request to our Moodle partner to please update H5P. So hopefully if and when they do this, we will then be able to view results again. Thank you for the additional information. If you are still having the same issue after the update please attach a screenshot fo what you are seeing. Thank you for this. Do you have a sreenshot similar to what I attached above. I have this view. While this is nice, previously I was able to view a report that included all students results. Thank you fo the updated screenshot. From the screenshot that you provided the H5P plugin is generating and sending the xAPI statements to the Moode gradebook. It is up to Moodle's settings on how to show these scores. Maybe a change in the settings when you upgraded to Moodle 3.5 has caused. I am also on Moodle 3.5 and I am able to see reports of all students in the same page. That might explain it. We upgraded to 3.5 in July. I will pass this on to our administrator. Thank you for your time.